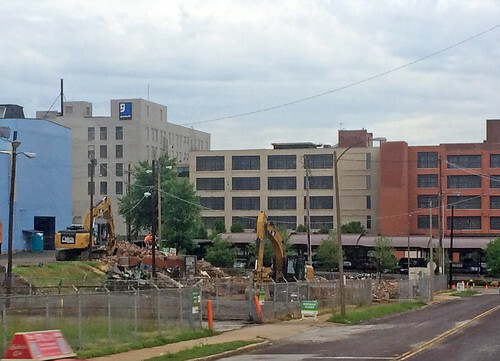 Demolition has begun on the Laclede Gas field office building on Forest Park Boulevard west of Vandeventer. Clearance of the 2-story building building just several feet from the sidewalk along Forest Park will complete the suburbanization of the Ikea site, leaving only the big new blue box that will sit 500 feet back behind a sea of surface parking. A view along Forest Park from earlier this year. The building, according to City records was constructed in 1936, and exhibits spare stream line detailing common for the period. This demolition is less about the loss of the office building and accompanying garage to the west, which was very utilitarian in style, than it is about the loss of an urban character along this stretch of the broad boulevard. Directly across the street a large grassy field still sits at the northwest corner of Forest Park & Vandeventer where the Welle-Boettler Baking Company complex was needlessly demolished by CORTEX in 2011. 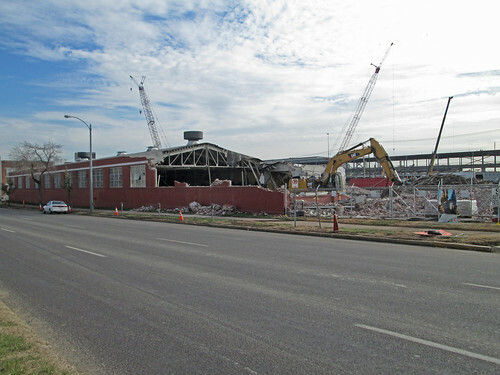 A view of the Ikea site from a point near the corner at Vandeventer. The suburban style Ikea site plan with parking in front and a three lane access road running parallel to Forest Park and Vandeventer. 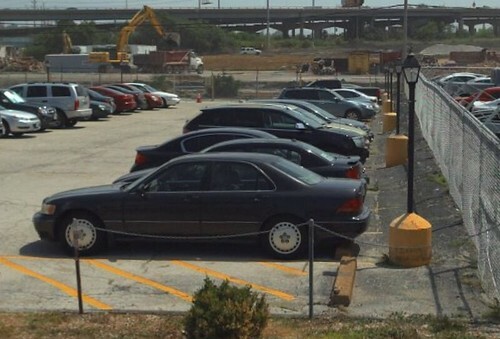 Like most Ikea stores, the new St. Louis store will also have parking under the building. 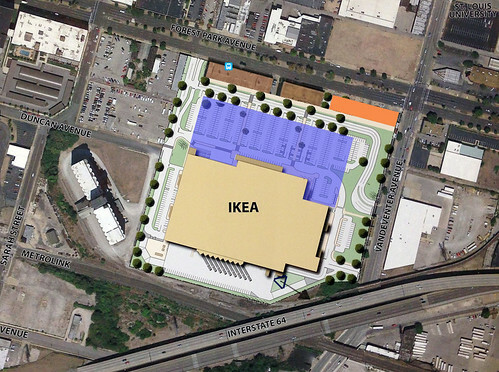 As NextSTL illustrated last year, the Ikea in Atlanta is in similar proximity to the center of the city as ours but has a better plan. Although the site is somewhat less urban due to interruptions of the street grid, the store and garage extending out below are packed onto a much tighter site. Instead of a 3-lane mall style ring road, the city street is fronted on the other side by two new multi-story apartment buildings. The ensemble is a much more urban solution fitting into an urban environment, and would fit entirely on the Forest Park & Vandeventer site. 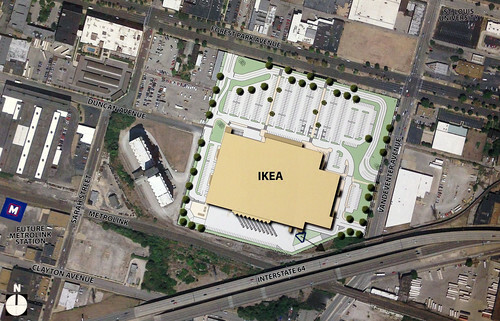 Even if the Ikea St. Louis was not fronted by a large apartment complex, another solution would be to include a row of smaller retail stores along Forest Park Boulevard. 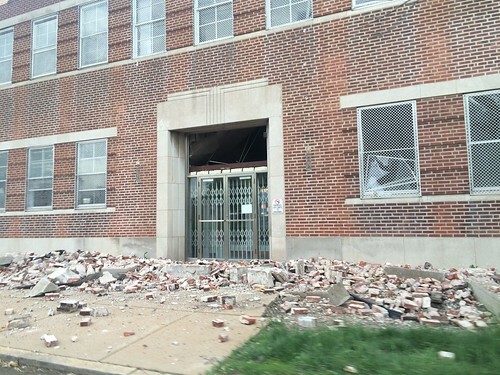 Through selective demolition the the front wing of the Laclede Gas offices, which was the same was 60 feet depth as a typical strip retail building, could have housed 10,800 s.f. of retail space. The upper level could have housed the same amount of office space for companies wanting to be in the CORTEX area. Instead of surface parking, an additional parking level would be built in the middle (shown in blue). The garage building west of the office structure, which was demolished earlier this year, could have housed an additional 19,600 s.f. of retail stores in 70 foot deep column free space under the large trusses seen above. East of the office building a new retail building could be 18,000 built for additional small stores (shown orange above) or a medium size 20-25,000 s.f. junior anchor could be built. The concept of lining the street with smaller stores is nothing new and a local example was built several years ago at the southwest corner of Manchester and Rock Hill Roads. From Manchester Road, the Market at McKnight is an attractive window lined pedestrian friendly experience. Yes, this corner of suburban Rock Hill is more urban than Midtown's Ikea site. Oh wait, they tore down a historic church for a gas station right across the street. 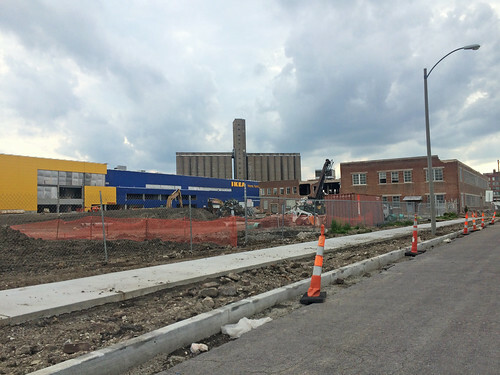 Like everyone else, I'm thrilled an Ikea is about to open in the center of the City of St. Louis, but it could be much more. 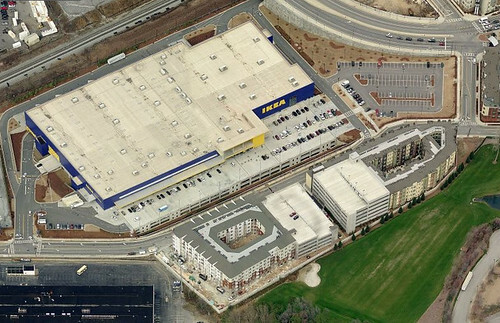 Additional development could always happen in the future on the parking lot in front of Ikea as was shown on an old CORTEX master plan, but what would be their incentive since they own the entire site? The site to the west bounded by the Ikea, the grain elevator, Sarah Street and Forest Park Boulevard is owned by CORTEX, who put out an RFP last year for a mixed use development. Hopefully this site will be fully built-up and not be a continuation of the suburban Ikea model. Probably the only parking lot in the region lit entirely by gas lamps is also gone. 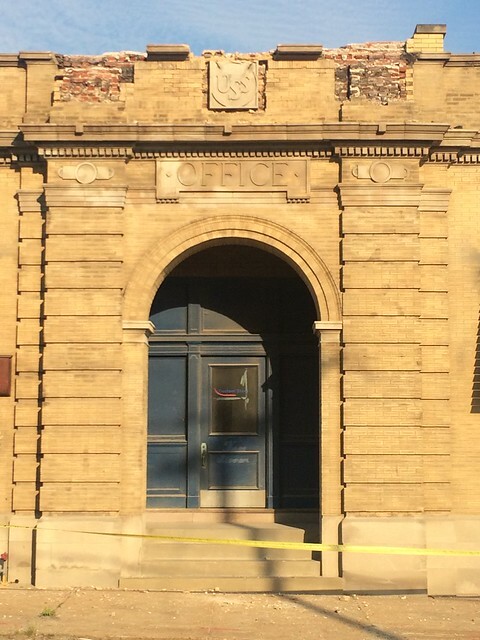 The first of two planned demolitions in the CORTEX district began last week with the destruction of this small but ornate buff brick building on Sarah Street that is part if the former US Steel complex. The complex is being demolished by CORTEX to make way for a multi-building project to be developed by Wexford Science & Technology. 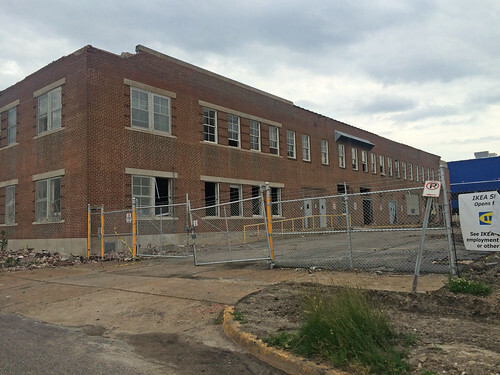 As reported last year by NextSTL, the development will include research, laboratory and residential buildings. 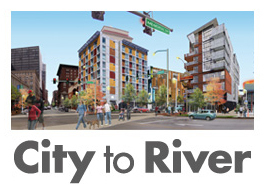 In a rendering that was part of the TIGER grant application for a new Metrolink station just east of Boyle, the corner of Sarah and Duncan that includes the footprint of the building above is shown with a building labeled "Build to Suit". This makes it seem like this will be a later phase of the development and that they have no idea what will be built there. In other words, the decision to take down the building or possibly incorporate it or part of it into something new could have been made later by Wexford or a future user of that portion of the site. The facade of the building that fronted on Sarah Street. The building was originally constructed as the office and bottling department for the Empire Brewery, a branch of the Independent Breweries Association. 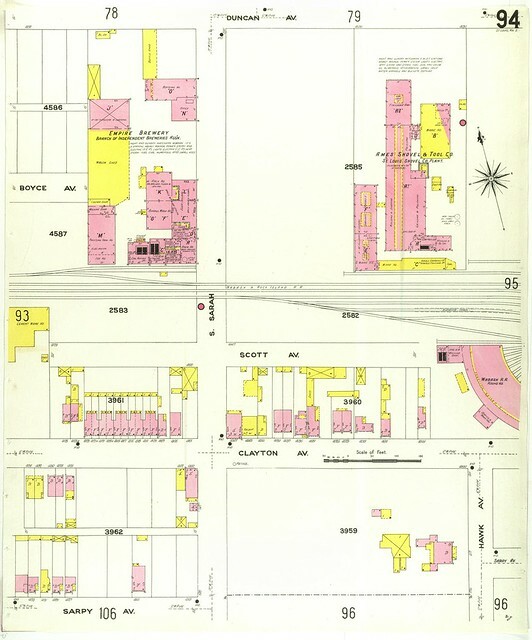 The building shows up on a 1909 Sanborn map below. 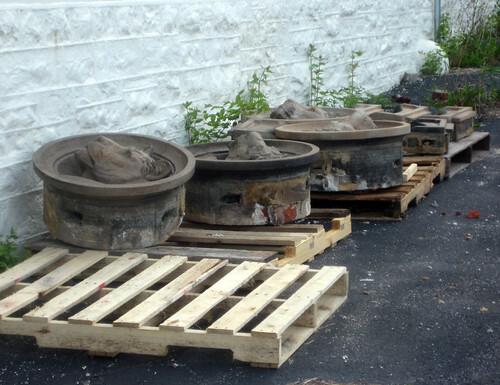 The larger light blue metal building that was built for US Steel will also be cleared. When I photographed the building a few weeks ago, the terra cotta loin heads that graced the corners of the building and flanked the entrance had already been chiseled out and were sitting on pallets next to the building. 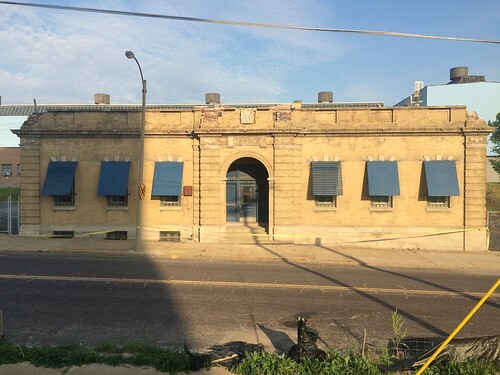 St. Louis Patina has some nice photos of the building when it was fully intact. The 1909 Sanborn map showing the L shaped building just south of Duncan on Sarah. By late Friday there was nothing left of the building but some rubble. 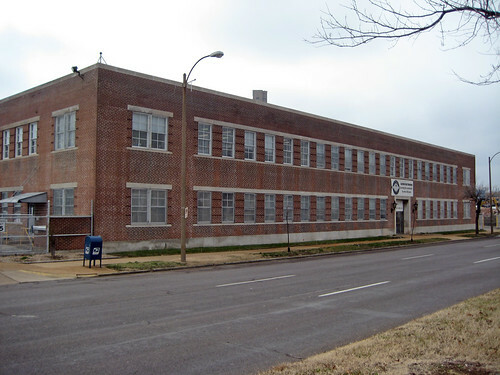 The other planned COTEX demolition that will likely be occurring soon is the Brauer Supply Building at the southeast corner of Forest Park Blvd. & Boyle Avenue. More on that soon.